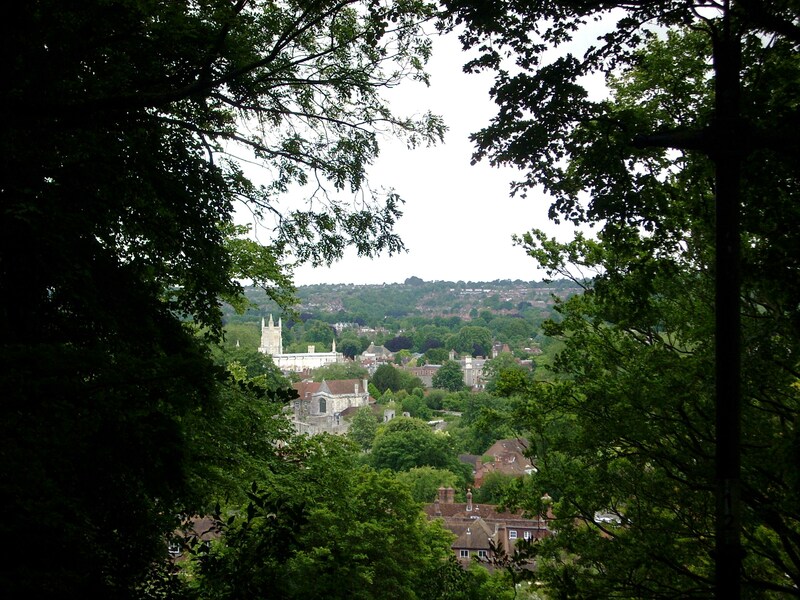 High above the city, under a sky threatening rain and lightening, St. Giles Hill in Winchester affords sweeping views of the townscape and landscape. Under my feet, an ancient roman stronghold. An elderly man, a World War II veteran that I met on the way up, told me that you could see the depressions where the Roman fort once stood. But I find no traces of the Roman fortress—only a softly mounded green hill, fringed with trees. Down below, to the east, the Cathedral stands, built of a whitish-yellow limestone, in bright contrast to the red brick of the town buildings. To the south is another wooded promontory. No wonder the Romans chose this lofty site from which to survey and dominate the lush surrounding countryside. 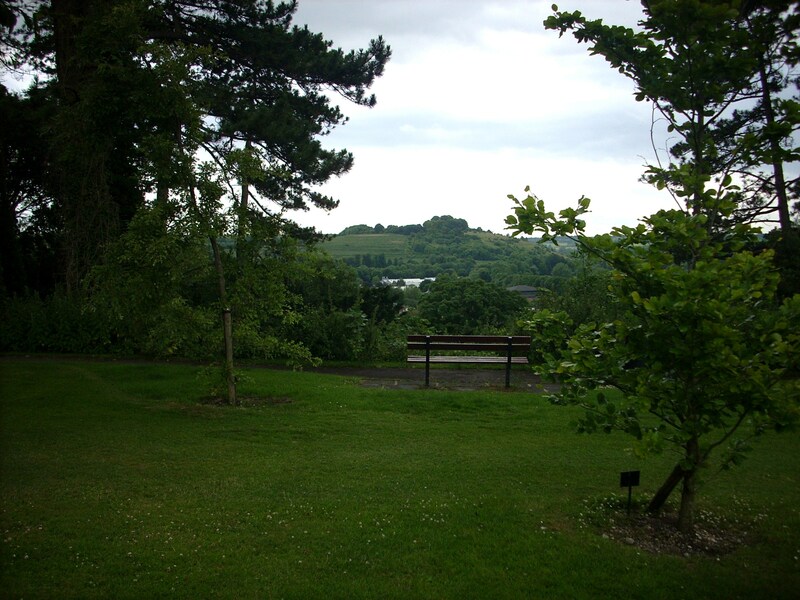 At first, I am the only one in this green monument to the past, but soon, I see an older woman, alone, sitting on a park bench, facing the next hill, looking out into the rolling hills to the south. The woman’s hair is all white and she wears a light yellow jacket, a bright patch of color in the gathering grey and damp of this July day, a summer that will not come. Despite weather that would drive most elderly folks indoors, she sits pensively, resolutely ignoring the misty clouds that are softening and tempering the view around St. Giles Hill. In the moment, I feel a sense of the uncanny: she seems an older shade of my solitary self, or I a younger version of her solitary self. How still she sits, how quietly she rests above this Roman ground. How could those armed centurions have imagined her, lightly sitting on a bench set upon the same ground that they trammeled underneath, amidst the clamor of sword and horse and sweat. She is a hummingbird in a moment of stillness. Though some might think her melancholy, I think she is quite content, as I am, here in this beautiful melding of literature and geography. Something powerful, perhaps, draws her to sit quietly here in the mist. Whatever it is, she has come to terms with it, I think. When I walk down from here, I will join up with High Street. There, there is a statue of King Arthur, or so I am told. It was recommended to me by the same World War II veteran I spoke with as I walked up the trail. How delightful it is to come upon an older person when one is out walking; often, they are open and so willing to spend a few minutes chatting. Our Veteran takes his walk here on the trails that encircle St. Giles everyday. In his right hand, he clutches a burnished wooden walking stick with a gnarled top. “Up to the top,” I say. And he again points out the path that I should take to the top. I am actually grateful to have the path pointed out to me as the trails between city and hill are not well marked and, with bits of urban debris strewn about, the woods here hover between natural space and slightly disconcerting urban space for a woman walking on her own. Though he had momentarily forgotten that he had asked me more than once where I was going, he had not forgotten Arthur and his presence here, almost 1500 years ago. Arthur may be the “first” king in our collective literary history, but not the historical first king. Read Geoffrey of Monmouth’s History of the Kings of Britain and you will read of the rise and fall of the kings of pre-Anglo-Saxon Britian, Arthur just one of the legendary rulers. Now, the mist around the hill has solidified to a leaden presence, pressing in around the hill, closing off the vistas. I head down to town for the warmth of a cup of tea by way of a staircase through a deep green wood where I would be no less surprised to encounter Merlin than I am an aged World War II vet who carries a gnarled wooden cane with a burnished burl at its top. Though he told me of the Roman presence, I could find no trace of Rome. Upon reentering the town, I come across the statue the Veteran had told me about—but it is not King Arthur at all. 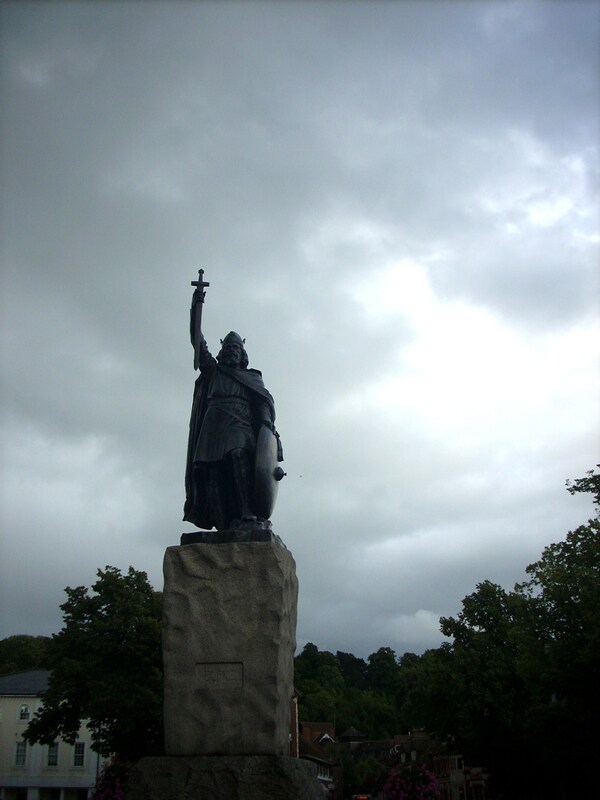 It is a statue of King Aelfred the Great, an Anglo-Saxon king. Aelfred reigned from 871 to 899 and was renowned for his love of education and law. Quizzical, I look back to see if our aged Veteran might be nearby—had he meant Aelfred or Arthur? Was as it a matter of confusion between our American and British accents? But our Veteran has long disappeared into the labyrinth of wooded pathways surrounding the base of St. Giles Hill. Well, this is the way the Arthurian legend seems to develop: fragments of the historical become interwoven with the mythical and become the story of a place. Rome, Arthur, Aelfred—they form a kind of mosaic of civic pride that made Winchester a place our Veteran dreamed of while a young man on the high seas and to which he came home when the war, at last, was ended.